The new US Forest Service Office near Sierra Vista, AZ. The damage brought by the Monument Fire was a tragedy that never should have happened. A Federal Incident Management team did not allow local fire fighters to do their jobs, and this display of incompetence by Federal officials has gone without being held to account. Had the Feds not come to the Monument Fire, our local firefighters could have put the fire out without the loss of any homes or businesses. I myself lost one of my investment properties destroyed by the fire, miles away from the base of the Huachucas. My attempt to save the home proved to be a risky mistake on my part. Now another branch of the Federal Government, the U.S. Forest service, is treating the City of Tombstone and its residents in a shameful manner. The fight is over access and the ability to repair and use the water line that runs from the Huachuca Mountains near Sierra Vista, to Tombstone. 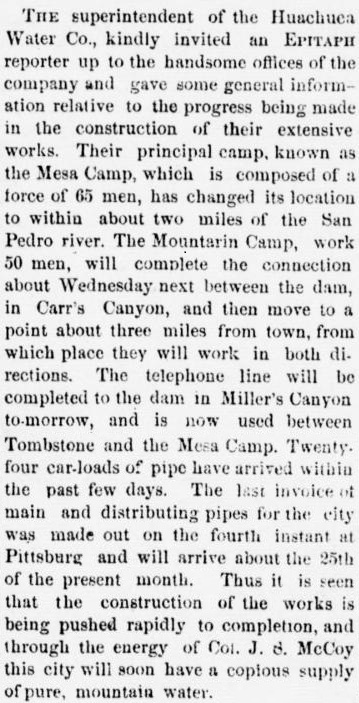 The construction of the Tombstone Aqueduct began while Wyatt Earp was still a Tombstone resident. 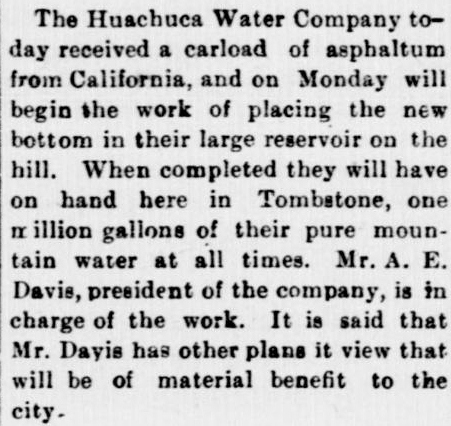 Water began flowing from the Huachucas to Tombstone in the summer of 1882. The aqueduct predates statehood in 1912 by over three decades, and predates the formation of the Coronado Forest as well. Under Arizona water law, first use of water means first right to it. Tombstone clearly has far more proof than it needs that this water source has been theirs for well over a century. When water began flowing through the Huachuca Water Company Aqueduct there was no entity known as the Coronado Forest, just the forest itself, and no location known as Sierra Vista, Arizona. I for one am glad that so much of the Huachuca Mountains have been set aside and preserved by the Forest Service, but preserving the Huachucas does not require that the U.S Forest Service deny Tombstone its rightful water source. If Tombstone’s use of this water has been somehow harmful to the forest, why hasn’t the Forest Service shown proof of this prior to the current controversy? The City of Tombstone has the right and need to repair its water line after the flooding that followed the Monument fire did great damage to the area. The fire destroyed the ability of plant life to hold the soil together in a normal rainfall situation, allowing boulders and large amounts of moving mudslides to damage the line. This water line, and access to it, is literally the property of the City of Tombstone. I have been amazed that Tombstone has lost in court over this issue. Given that they have such a strong case, they may wish to consider using other counsel given the results that their current counsel has yet to produce. 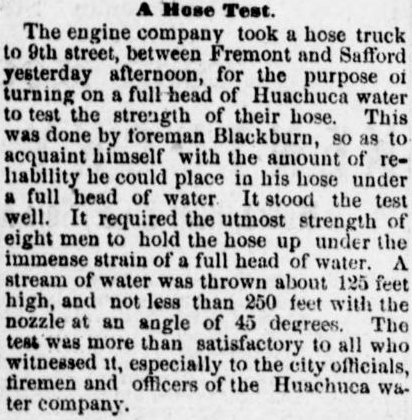 There is no question that the City of Tombstone is greatly in need of this water from the Huachucas, which is theirs. As with other mining towns, well water that is safe to drink is not always as easily found as might be assumed. But the larger issue is this. This water belongs to Tombstone, period. 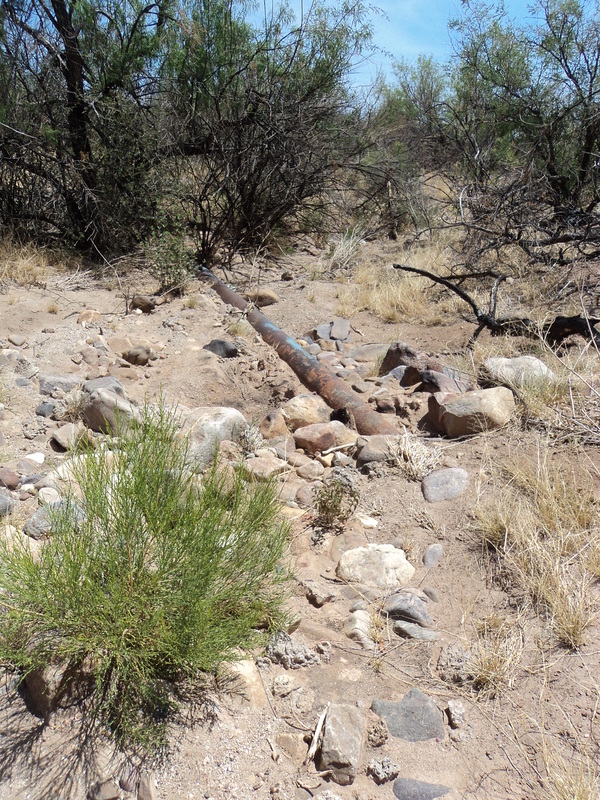 The argument should be that the Forest Service has no right to deny Tombstone access to repair their water line, when their water line existed BEFORE the formation of the Coronado Forest. The Forest service has no legal grounds or authority to demand Tombstone receive their permission or their permits to maintain their aqueduct. Regardless of needing the water, (which Tombstone truly needs) the water belongs to Tombstone, and Forest Service claims to the contrary, are false. The Forest Service is harassing Tombstone by not allowing them to use backhoes and other heavy equipment to repair their line. This is indeed ironic. A few miles south of where the Tombstone aqueduct crosses underneath state route highway 92 the U.S. Forest Service has a new office complex under construction for their use. Are they having picks and shovels used for their construction project? Heavy equipment at the new Forest Service complex-no shovel brigade here. No, of course not. That would be inefficient, time consuming, and make the job far harder than it has to be. But in the case of Tombstone the Forest service is forcing them to go through exactly such a waste of time. They’re making it hard on Tombstone as they likely just don’t want them to have the water at all. The construction site for the new Forest Service office has many pieces of heavy equipment being used. But in the case of Tombstone, the Forest Service is insisting on forcing the repairs to be done without benefit of the very same heavy equipment that is being used to construct the new Forest Service office and complex just south of Sierra Vista. This hypocrisy is blatant, and Tombstone workers have been forced to form a “shovel brigade” due to this harsh treatment at the hands of “public servants” at the Forest Service. I’m sure that some in the Forest Service will see this as different, given the aqueduct is high in the Huachucas in the protected forest area, and their new office is a few miles from the base of the mountain. But this is a distinction without a difference. If the Forest Service itself is using heavy equipment for its needed project, it has no right to deny the City of Tombstone to use the same heavy equipment for their needed repairs. The Forest Service simply has no legal right to deny Tombstone access to THEIR water, but they are denying them their rights regardless. 2012 image of original Tombstone Aqueduct. Photo by John Rose. Some property owners nearby have aligned themselves with the Forest Service against the interests of Tombstone. And yet, if their title work was done properly when they purchased their land, and they actually read said title work, they’d know that Tombstone already had an easement across their property to maintain the aqueduct. They’d also know that this was part of their property BEFORE they purchased it, and have nothing to complain about. In the wake of such public Forest Service opposition, and their assertion that allowing the repair of the aqueduct to possibly be of harm to the environment and some species, some property owners have gone so far as to threaten to shoot at anyone trying to repair the line if it’s on their property. The Forest Service should publicly condemn such outrageous threats at once. They should deescalate their rhetoric and stop portraying Tombstone’s desire to use its water source as the cause of the trouble, when they are only exercising their rights under the law. It is also a curious event that in the middle of this controversy, suddenly, a Mexican Spotted Owl has now been cited in the contested area. How interesting. Forest service officials bristle when being accused of being uncaring bureaucrats, who don’t care about the people of Tombstone. I offer them a simple solution. If you do not want to be correctly accused of being uncaring bureaucrats who don’t care about an entire community, then stop behaving like uncaring bureaucrats who don’t care about an entire community-because that’s exactly what you’re doing. If we as Americans are really of the mind that allowing a historic desert community to be denied its critical water supply is acceptable, so that some trees and plants don’t get cleared by a tractor in the process, then we have lost our way and our values that once made us great. There are those who love the Tombstone story but do not live in the area and have little idea of the sacrifices that many of its current residents make to keep the town alive today. I myself do not make the sacrifices that the Tombstone residents of today do, as I do not live there. Tombstone has no hospital, its residents often drive for medical, retail, and many other services. Rising fuel costs have impacted their businesses as well as their own personal budgets, but they persist in staying. The recession has closed a number of businesses in Tombstone, while those who remain persevere in the face of increasing difficulties. Many gladly do so because they want to be a part of keeping such an historic location alive for current and future generations. They refuse to allow what no previous generation would allow, that Tombstone would become a ghost town like so many of its contemporaries in the area did. They also are taxpayers, who have the right to not have their government, under the auspices of the U.S. Forest Service, deny them their right to a water source that they’ve had for well over a century. Instead of receiving support and encouragement from their government, they receive opposition and harassment, and have been unfairly portrayed by Forest Service Officials in the matter. Your opinion matters, and your opinion can make a very needed difference. From the Tombstone Epitaph April 17 1882, a worker was killed during the construction of the Huachuca Aqueduct. “Saturday, October 10, 1885. Was at the telephone today at 11:00 A.M., and Judge [Michell] said Indians were in [the] Swisshelms and Sonora. The building closest with the steps leaving the rear of the two story is the Huachuca Water Company office. Also visible is the Golden Eagle Brewery and behind that Schieffelin Hall. Cropped from the original Fly photo in the collections of John D. Rose. Water bills for the entire year of 1938, showing that over a half century after its inception, the Huachuca Water Company was still serving its customers. Original water bills from the collections of John D. Rose. Ex Sheriff Behan attempts to tax for a fee the Huachuca Water company. Special thanks to Kevin Pyles, Cochise County Archives. 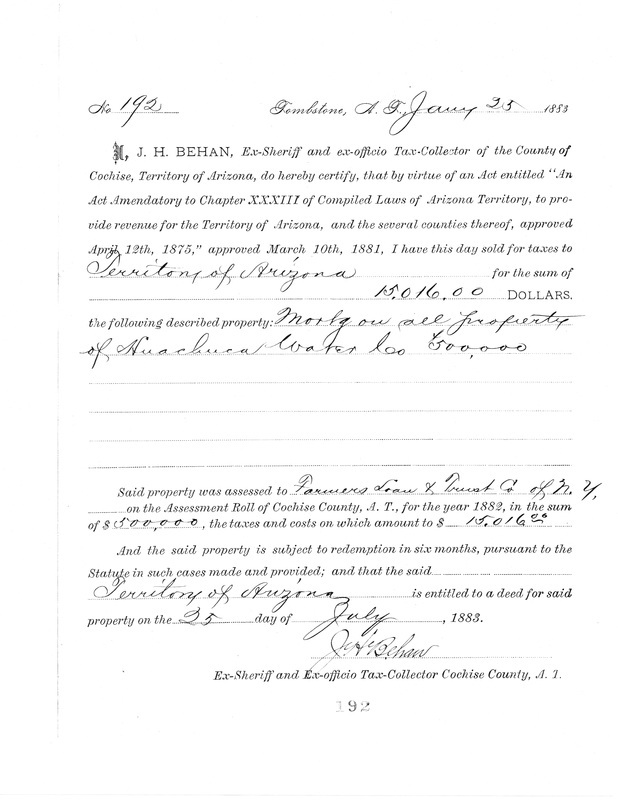 Page from the 1886 assessment and tax roll, courtesy of Kevin Pyles, Cochise County Archives. Copyright John D. Rose, all rights reserved, 2012, 2013, 2014, 2015, 2016, 2017, 2018.